Your parents will constantly remind you of this, but you are at school to get a degree. There are times that you will be stressed & running on little sleep but if you put in the work, then everything will be okay (even if it doesn’t seem like it). Take advantage of the resources your school provides for tutoring- I’m so thankful for the TA’s & physics tutors that helped me complete my homeworks & learn the material when I couldn’t understand my teacher. If you are social like me, then use social events as your motivation to finish your homework sooner! It is an amazing feeling to constantly be inspired by your peers. Surround yourself with people who are ambitious & have big goals in life! This summer I got an internship with my dream company & I don’t think I ever would’ve pursued it had it not been for my friends who achieved their own dreams & pushed me to do the same. I was getting ready to settle for whatever job I could get & after seeing my friends get their dream job I would ask myself “if they can do it, why can’t I?”. 5. Get out of your comfort zone! The more you get out of your comfort zone, the more you grow. I’ve tried to say yes to more things since starting college. Some of my favorite memories come from times I got invited to something, thought about not going, & then changed my mine. I am especially thankful for the times I got out of my comfort zone while searching for jobs! I dragged my friend with me to a career fair when we were freshman & getting that early start talking to professionals was so helpful. I felt so much more comfortable talking to professionals at events & interviews when it counted after conquering my initial fear & getting that experience. Guys, I come from a past of so much negativity. It literally used to swallow me. After being in college, I have been so happy and I really think it’s because I’ve been able to remove myself from so much negativity. You choose your friends in college, so choose to be around positive people who support you and make you happy! If someone is trying to bring you down then why the heck are you letting them? Do not be around that person. College is going to get hard. There are so many points where you have to hold it together. Any time I’m fighting off a meltdown or nerves, I try to give myself little pep talks like “You can do this. You can do this. This will be easy” & it makes me feel a lot better after a couple of deep breaths. Try to also remember how far you’ve come next time you need a confidence boost; there’s so much to be proud of whether it’s the fact that you got into the school, or you’re paying for your school, or you’ve been a positive figure in someone’s life, etc. Getting organized will save you so much headache in college- the last thing you want to do is miss an assignment or meeting. Use Google Calendar to keep track of all your tests and homework assignments. If you prefer to write it down, then get a planner! 1) Support each other: Be there when your friends need you. If they are feeling down, give them a pep talk! If your friend has a dream company & you know someone that works there, connect them with that person! If your friend is trying to run a business, website, or produce music, help share their events & links by word of mouth or on social media! Hopefully they will reciprocate when you need their support! 2) Fix your relationships: The best things about making friends is that your relationships are all brand new. If something goes wrong or you have a fight, then why not fix it? Tell your friend how you feel and work it out. Confrontation is always uncomfortable but gets easier with experience and will make life easier than if you avoid your issues with a person. 3) Don’t parent your friends: Everyone in college has just got away from 18 years of parenting. It’s time for them to start making their own decisions on what’s right and wrong. People are going to do different things from you and maybe things that you don’t agree with and you shouldn’t judge them. Now if the thing your friend is doing is life threatening, then yes by all means interfere. Otherwise, just live your life and let others do the same. 4) Be with those that make you happy: In college, sometimes you have limited free time, so make sure you’re spending it with people that you have a great time with. I regret the hours I spent being bored with certain people when I could’ve been getting to know other people better or making crazy memories. If you do something stupid or make a mistake like hardly studying before an exam, talking behind someone’s back, oversleeping, etc. then learn from it & don’t do it again. There is no self-hate like the one that comes from making the same mistake over & over again. It has been so much fun exploring Atlanta with my friends (I even started a blog about it!). There is never a dull weekend because we’re always going to events, new restaurants, or to the park. 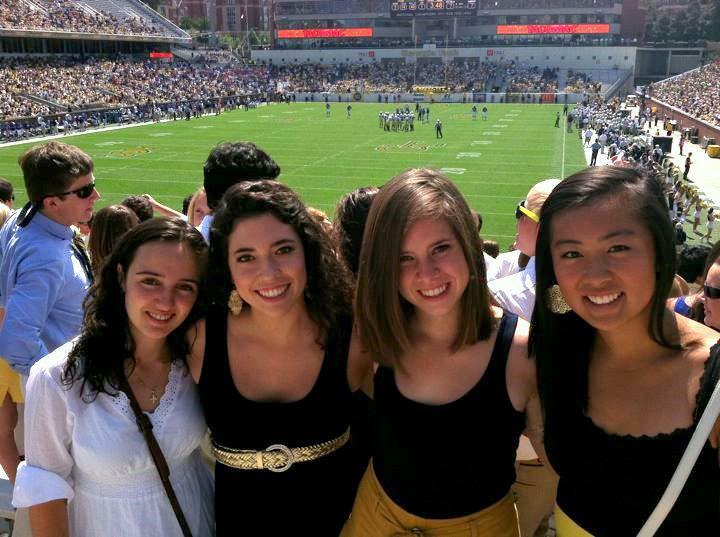 Exploring the city of your school is a great way to bond with friends but also to just appreciate where you are! Knowing that there are so many places in Atlanta I haven’t seen yet always makes me look forward to going back to school an extra amount. Every school has events to promote school spirit whether it’s football games, festivals, or listening to your marching band blast music during finals week. There is no feeling like the one you get when you realize you’re part of such a large community. Getting involved and going to events will help you have a greater appreciation for your school. The times I’ve gone to events where we sing the fight song as loud as we can or cheer on our peers are ones that I will remember forever. I hope that this post was helpful (even if it was super long). I’m so glad my college experience isn’t over yet and I’m excited for you to start yours! Feel free to leave any questions below! Good luck! REVIEW: Lee Stafford Ubuntu Oils from Africa Hair Line!